You don't have to live in Newton Abbot - our members come from Exeter, Dawlish, Teignmouth, Torbay, Totnes, Ashburton, Buckfastleigh and beyond. 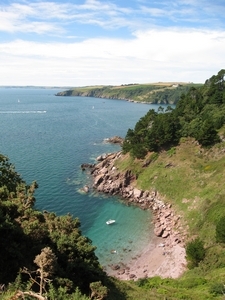 Our walks go anywhere in South Devon, East Devon or Dartmoor, with occasional forays into North Devon and further afield. We are a flourishing and friendly group, with no age limits, and many of our members are senior citizens. 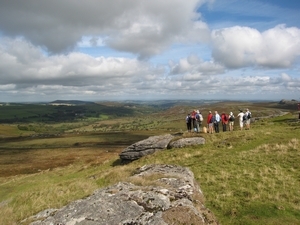 Each week we have up to six walks, of anything from two to twelve miles, spread over four or five days of the week. A typical walk might see 10 to 30 people turn up, depending on the weather. Some walks are over fairly flat terrain, but the best views tend to be found on walks which involve a hill at some point. Each walk is led by a volunteer member, and no-one gets left behind. A click or a tap on Forthcoming Walks will show you our walks for the next few weeks. If the print size on any of our pages isn't quite right for you, you can zoom in or out by holding down your Control key and scrolling the wheel on your mouse. Alternatively, hold down Control and press + to zoom larger, or - to zoom smaller. We occasionally update this site, principally the Forthcoming Walks, Forthcoming Events, Notice Board and Walk Reports pages. To make sure you are seeing the latest version of whichever page you are looking at, click or tap on the Reload symbol which you should see in the header section at the top centre of each page. Alternatively, press the F5 key, which is in the top row of most keyboards. If any page on this site still doesn't look quite right, try holding down your Ctrl (Control) shift key, before pressing F5. This will reload all of the files associated with the page.